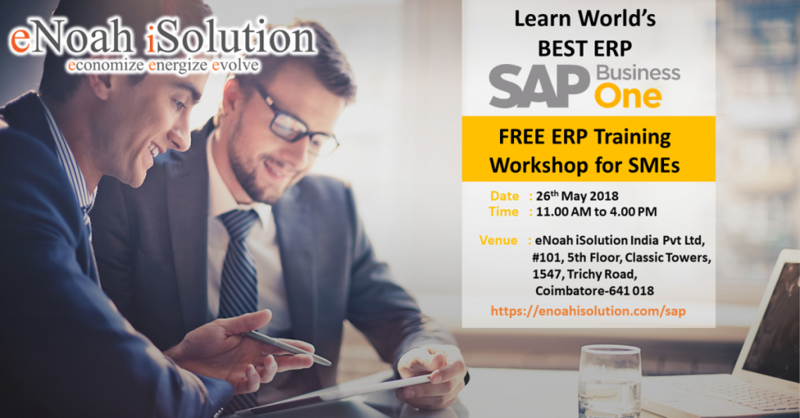 SAP Business One ERP Training is an initiative by eNoah iSolution, Coimbatore to empower SMEs to effectively use ERP to grow their business. This FREE ERP training workshop helps Small and Medium Enterprise companies to learn the world’s best ERP SAP Business One with live demo and classroom session. eNoah iSolution India Pvt Limited. Classic Towers (Opposite to G.H ) 5 & 9th Floor, Trichy Road, Coimbatore – 641018.